Special Shampoo with Fresh Air and Anti-Alkal Formula -phosphate-free - Combi Active Shampoo is a highly concentrated shampoo with the most powerful cleaning effect and thus intensively dirt and fat-dissolving. The product is easy to rinse and gives a radiant shine on all smooth surfaces.Very suitable for biological water treatment plants. 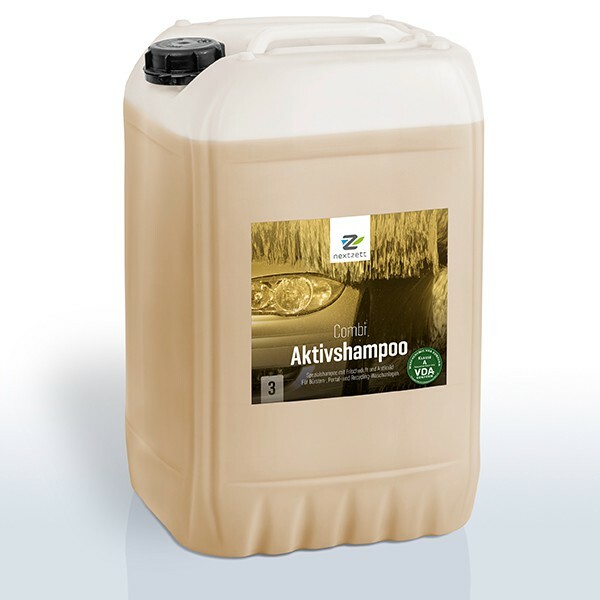 nextzett Combi Active Shampoo is a specially developed for Portal plants and car washes with hot water recycling and / or highly alkaline prewash brush shampoo on the basis of anionic surfactants, chelating agents and fragrances and dyes. nextzett Combi Active Shampoo is a highly concentrated shampoo strongest cleaning action and thus intense dirt and grease removing. It impresses with its excellent washing result and extends the life of the brushes and textiles by its self-cleaning effect. Despite fluctuating quality of service water, excellent drying results as well as clean brushes are achieved through the built-in anti-calculus formula. The surfactants used are all readily biodegradable and behave in the waste water environmentally neutral. nextzett Combi Active Shampoo is easy to rinse and gives radiance to any smooth surface. nextzett Combi Active Shampoo was tailored to the needs of car washes with water treatment plants, so always a good drying is ensured and that no odor problems in summer. Application and dosage according to the equipment manufacturer. Optimal effect with a final dilution of 0.15-0.30%. Use pure to 1: 3 via a dosing pump or to 1:20 prediluted via the injector of the brush washing zone. The dosage should be adjusted in such a way that a slight foam formation can be seen during the application but this is still to be removed during final rinsing.